Need more information about booking Home 7330647 ? 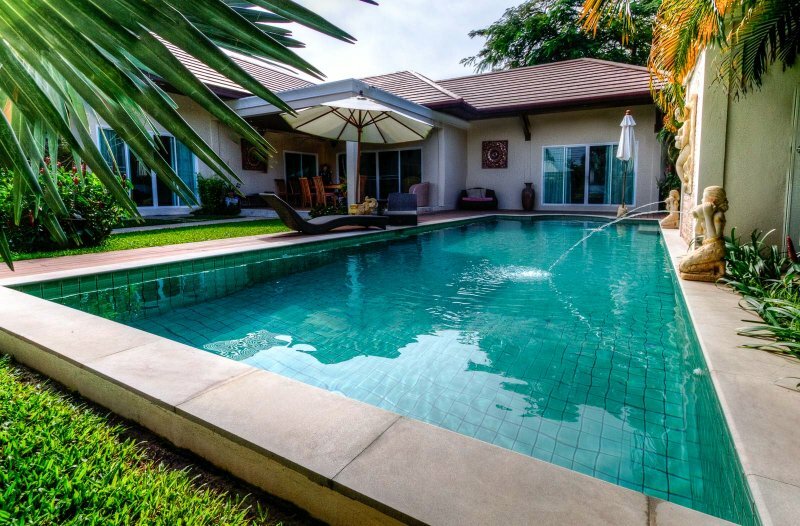 Spacious, private villa, south of Phuket just minutes from Rawai and Nai Harn beaches. Thai Villa 6 persons, 3 large double bedrooms, large living room, salt-treated swimming pool with spa, closed garage. Quiet area and close to all shops The villa The villa Pommard is modern and luxurious, completely private, it can accommodate 6 people. It has 3 large double bedrooms with dressing room and workspace, a bathroom with walk-in shower for each room. The kitchen is modern with a central island and a bar, fully equipped (oven, hob, toaster, microwave, coffee machine, refrigerator, water fountain ...). The living room is spacious and comfortable with large flat screen, satellite, dvd player ... A nice covered terrace facing the pool or you can lunch in the shelter of the sun, a wooden deck with deck chairs and garden furniture. A beautiful salt-treated pool with spa area and outdoor shower. Each room is equipped with individual climate control and ventilation. You also benefited from a covered and automated garage. The villa is secure, built on a wooded and flowery 600m2, without vis-à-vis, you will be quiet. Access for travelers You have exclusive and unlimited access to the villa, there are no common areas. Linens are provided and the cleaning service is included: Change of towels three times a week, change of bed linen once a week. Pool and garden maintenance service also included. Unlimited internet access and wifi network included. Safe available. Cot on request (50 euros / week) Exchanges with the travelers According to your wishes, I remain at your disposal to orient you on the island. I am reachable throughout your stay in case of needs or advice. The neighborhood The neighborhood is very nice, quiet, good life. There is a local market nearby, many shops and businesses of all kinds. You will not miss anything. There is also a local agency that offers many outings (island tours, snorkeling, diving, jet skies, trekking elephants, zoo, quad, karting, rafting, shooting range ...) you have everything on square. A few notions of distance: 2 km from Rawai Beach, traditional restaurants by the sea. 5 km from Nai Harn, the most beautiful beach on Phuket Island. 5 km from the port of Chalong, to visit the many paradise islands. 5 km from Chalong Buddhist temple, the most beautiful of Phuket. 10 km from Big Buddha. 10 km to Phuket Hospital. 15 km from Patong, famous for its nightlife. 50 km from Phuket International Airport. Transport You have the possibility to rent a car or a scooter on the spot for your displacements. I can also send you a taxi to the airport. Other remarks Arrival time: from 15h00 to 18h00 Departure time: from 08h00 to 11h00 Late arrivals fee: 1000 THB Electricity not included: 5 thai bahts per unit Internal rules Respect for staff, places, and neighborhood.